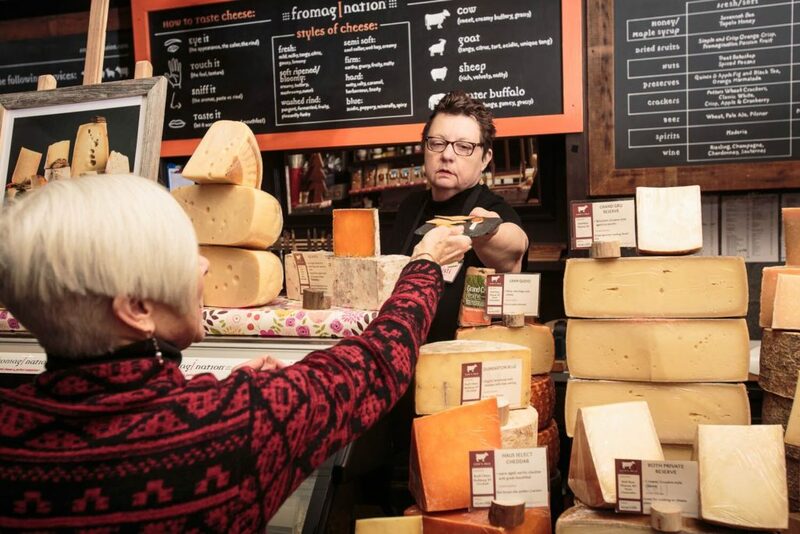 Our featured Cheesemonger for the month of April is Kristi O’Brien. 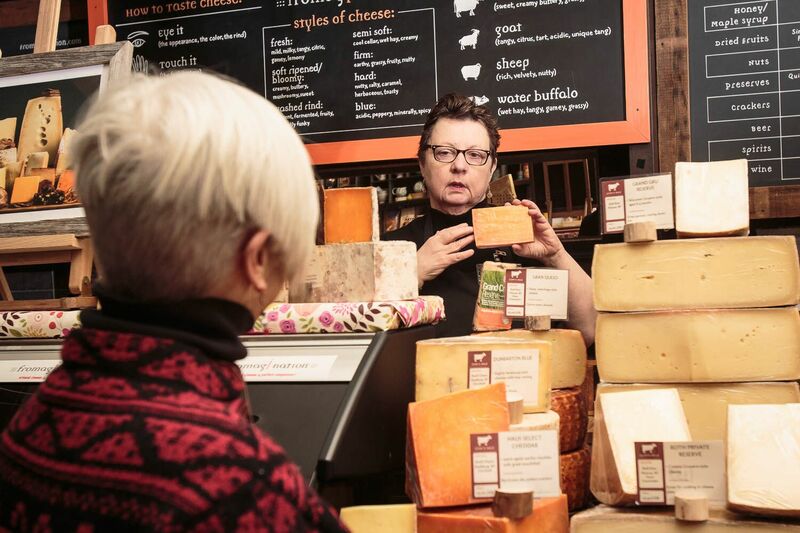 Kristi is Fromagination’s most seasoned cheesemongers and matriarch. We sat down with her and asked her to tell us a little more about herself! How long have you worked at Fromagination? I have worked for Fromagination for a number of years, not since the inception but shortly thereafter. I have enjoyed my work here immensely and as a result of working here for the duration that I have gotten to know a lot of loyal customers and getting to know them on a first name basis, that creates a more personable interaction with my customers. My title is cheesemonger. In addition to advising customers on styles of cheese or helping them with their needs, I take care of the cheeses in the cases, I look for imperfections and try to elevate the standards that we have here for our cheeses and companions. I do other things here; such as compose the cheese of the month letter every month. And try to advise my fellow cheese mongers, find out what they need from me and get what I need form them. One thing I enjoy I giving customers tips about pairing cheeses, especially when they are thinking of putting together a cheese board. I’d recommend using cheeses of different milk types or different textures, and definitely try to include a blue cheese on the board. I can’t stress enough the importance of having something salty, sweet and savoury on the board. Having salty olives and sweet chocolate makes for an interesting dining experience. 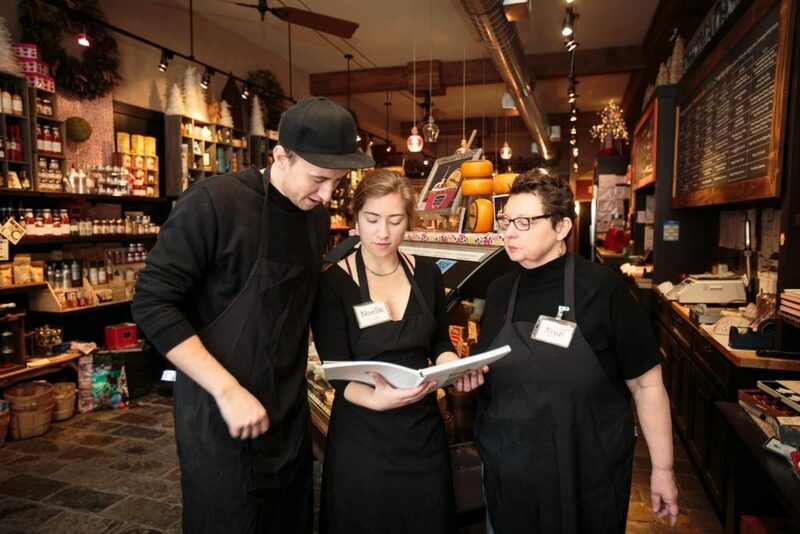 You have a culinary background, why make the shift from restaurants to a specialty cheese store? I was at a point in time where I wanted to make a change, take an other direction. When I heard that Fromagination had just opened, I pictured myself working the front of house, as opposed to working in the back in the kitchen. It’s been wonderful in term of interacting with different kinds of customers and personalities. I’ve also learned that I actually enjoy it. This keeps me more social compared to when I work in the back. How much has Fromagination changed in the time that you’ve been here? Fromagination has changed immensely! We are extremely focused on locally produced items and therefore consider ourselves very fortunate to have a number of artisans here in the city that make companions to pair with cheeses. Everything from honey to preserves, to crackers, to chocolate. We are really blessed here in Madison that we have such a wide variety of artisans. I think Madison has come a long way by having these producers in the last 10 years, and frankly I look forward to the next 10 years for this industry. Fromagination has been able to centralize all these amazing products, given some of these artisans a platform, and worked together to help curate the Fromagination identity. We have researched many producers, and we have therefore chosen the best of the best that the area has to offer. Have you noticed a change in how people eat cheese? People are getting much more adventurous when it comes to cheese now. Above all, there has been a huge artisan cheese movement and people are willing to branch out and be more adventurous and less cautious. It really is a matter of trial and error. People are also starting to really notice that cheesemakers go to great lengths to develop wonderful flavors within the cheeses and I believe that people are just more comfortable eating more of these artisan cheeses. Much more so that in the last 10 years. It’s just wonderful to watch people’s expressions on their faces when they decided to try something they wouldn’t ordinarily and remark that it’s something very enjoyable. What is the latest cheese pairing that has really surprised you? Actually, trying to pair cheese with licorice for instance. Licorice is quite strong and is therefore not to be paired with something mild. The rule of thumb is to pair something strong with a strong flavor. Therefore, licorice pairs extremely well with aged gouda. In some capacities it pairs very well. Just to be clear, I’m talking about the Scandinavian style, very salty licorice. As far as I’m concerned there is only one kind of licorice. It is not for the faint of heart! In conclusion, come on down to Fromagination if you want to discuss cheese and companions with Kristi! This entry was posted by Chris in News & Announcements, Uncategorized. Happy to read this and learn more about Kristi. She’s always been so helpful to me at the store, and, of course, so knowledgeable. Now I want some of that licorice.